It’s night time and you’re taking off your makeup. How do you do it? Do you use makeup wipes? Do you wash your face? Both? On more nights than I care to admit, I use makeup wipes and call it a night. Or I wash my face when I’m practically asleep and am not paying my full attention. Recently I woke up and found myself looking really… tired. Raggedy. And I couldn’t figure it out because I’d had an amazing night of sleep! But when I awoke and looked at myself in the morning it looked like I hadn’t slept well. If you’ve been there and wondered what you could do to look less tired, try what I did. Do yourself a favor. This may sound silly or obvious, but humor me. Take one or two Q-tips — for me, I prefer the Q-Tips Precision Tips for this task, they’re pointier and can get the job done more carefully. Use the gentlest eye makeup remover you have. Right now I love Estee Lauder’s Gentle Eye Makeup Remover. So gentle and soothing and oil free! 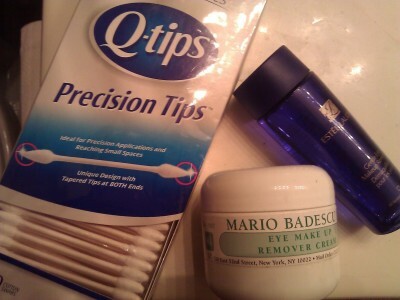 I also LOVE pretty much all of Mario Badescu’s makeup removers, and their eye makeup remover cream is also excellent. OK now dip your Q-Tip in your eye makeup remover product of choice. Swipe along the lower lashline. Look at the Q-Tip. What do you see? If you’re like me, you’ve got layers of residual makeup darkening the end of your cotton swab. Of course I might wear more eye makeup than most, but even on days when I think I went light on the eyeliner, I wind up with a dirty Q-Tip after trying this. Gross. It’s incredible, as I get older, how much makeup and dirt is able to hide in the tiny crevices under my eyes! And by incredible, I mean disgusting. The time has come for me to truly show my under-eye area more love. This is how it begins. Cleansing! As you know, I’m a Q-Tips Tipster and I also use them to clean up my look when applying eye makeup in the first place. I use them most often on my nails and around my eyes, really anywhere that my big clumsy fingers can’t be of the most precise assistance. This is literally what I used to remove my makeup last night, after an incredible photo shoot with Bisi of Crystal-Eyez Makeup Artistry! Can’t wait to show you the pics!! The Q-tips for Good program will feature a different charity every two weeks from May 21st through July 1st. From now until Sunday June 3, they will be featuring Operation Gratitude. Q-tips donated 1 million q-tips cotton swabs to Operation Gratitude, including Precision Tips travel packs for Operation Gratitude’s Memorial Day shipment. Operation Gratitude annually sends 100,000 care packages filled with snacks, entertainment items and personal letters of appreciation addressed to individually named U.S. Service Members deployed in hostile regions, to their children left behind and to Wounded Warriors recuperating in Transition Units. Click here to learn more about Operation Gratitude. You can visit facebook.com/qtips to learn more about precision tips and Q-tips for Good! How do you look less tired? How do you use Q-tips? Did you know you’re not supposed to use them near your ears? The more you know! This is a sponsored post. Q-tips® product was provided by Unilever, the makers of Q-tips®; my tips and usage suggestions are my own. « New Hair Products You Need To Know About ASAP! I know you should not use them near your ears! I do anyway. I use them to clean up my at home mani pedis, and to clean small spaces in my office and home. I can’t sleep with make-up on at all. To remove, I’d use Neutrogena Make-Up Removal Towelettes. Cotton swabs with baby oil to remove the under-eye goop, then wash my face and neck with cleanser. 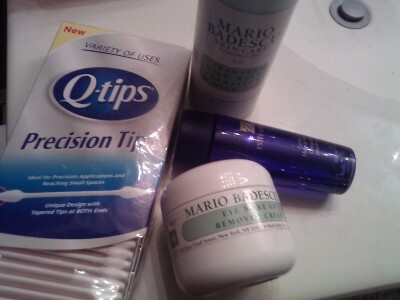 Whenever I come to my home from outside I use face wash but to remove my make-up I use Mario Badescu’s makeup removers. Their products seems to me the best one. I have used Q-Tips as well as Estee Lauder’s Gentle Eye Makeup Remover. Thanks for the suggestion, Afrobella.